The hunger strike of three students in protest against the government’s plan to implement the controversial National Education curriculum ended prematurely after the blood sugar level of one of the students was found to be very low. The hunger strike, which was supposed to be for 72 hours, ended at midnight after having gone on for 56 hours. The student whose health condition was at stake was apologetic, saying that she would have liked to persist until the last moment as she had pledged. A positive development is that ten citizens, ranging from tertiary students to retirees, have now gone on their hunger strike and taken up the fight with the government. 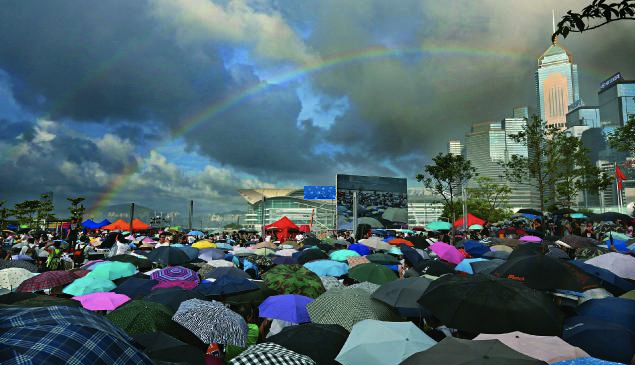 At the venue of yesterday’s assembly, which was reported to be attended by 40,000 people, a double rainbow stretched across the sky. Obviously, it was God’s way of giving the movement His encouragement and approval.